Stability triumphs over reform, as Karimov and Nazarbayev retain power in Central Asia. The two most important countries in Central Asia have completed their presidential elections, both held early. Uzbekistan summoned voters just after the Nowruz festivities, on March 29. Just across the border, Kazakhstan went to the polls on April 26. 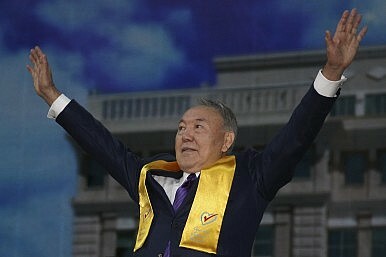 Both elections featured Central Asia’s strongmen, Islam Karimov in Uzbekistan and Nursultan Nazarbayev in Kazakhstan. Both have been leading their respective countries since independence and had no problems securing another victory this time around. Like the last few elections, there were no surprises, with the two incumbents widely expected to seize around 90 percent of the votes as soon as the elections were announced. Karimov confirmed expectations with 90.39 percent, while Nazarbayev did even better with 97.7 percent of the votes. People in Uzbekistan and Kazakhstan are well attuned to political realities and did not expect surprises. They knew that Karimov and Nazarbayev would win without problem. Other candidates were mostly unknown to the wider public and some were not allowed to campaign, while others dropped out. Little attention was paid to party programs or their political vision. In fact, there was little campaigning in general. Indeed, this can be described as the season of austere elections. It was impossible to find a viable alternative or to have a conversation about the plans of opposition parties, which in some occasions pledged allegiance to the incumbent. The personality of the candidates was the most important feature for the voters, and Karimov and Nazarbayev went to the polls with a definite advantage in this respect. Many people in Kazakhstan were convinced that Nazabayev was the best candidate. His signature Nurly Zhol program, unveiled in November 2014, and his most recent speech on March 11 can be considered his presidential program, with specific steps and a strategy for the government. In theory, even if the chances of beating Nazarbayev were miniscule, anyone over 40 and fluent in both the Russian and Kazakh languages could have run. In practice, the short time allowed for campaigning and the absence of a cohesive opposition created space for only two other candidates. Among them, only one chose to run a proper, albeit cheap, campaign. Abelgazy Kussainov, the current chairman of the government-nominated Federation of Trade Unions, had little presence in the posters around the cities next to Nazarbayev’s election ads. Kussainov finished the electoral race with fewer than 1 percent of the votes. The other candidate, Turgun Syzdykov of the Communist People’s Party of Kazakhstan, was invisible to the public, and similarly received around 1 percent of votes cast. Similarly, pluralism was proclaimed in Uzbekistan, with each candidate granted 900 minutes of TV and radio time. They could also present their program and political views in print media as well. In practical terms, though, most of the attention was paid to Karimov. Contestants praised Karimov’s policies during their campaign speeches, vaguely proposing to continue his work. The presidential campaign, just as in Kazakhstan, was announced with the shortest possible notice allowed by the constitution. During this brief period, Karimov rapidly visited various regions of Uzbekistan, dismissing speculation that he was in a coma. In one of his last speeches before the polls opened, Karimov further emphasized the need to expand the role of the parliament, while criticizing parliamentarians who are not demonstrating sufficient initiative. Both leaders also told their fellow citizens that the challenging geopolitical situation could only be overcome only if they stayed in power. A threat to stability in the context of the Ukrainian crisis, the economic slowdown could be tackled only by a stable and experienced leadership, they argued. Karimov and Nazarbayev followed a rather similar policy towards the Ukrainian crisis, the Russian currency meltdown, and the Islamic State threat. The U.S. has equipped them with anti-terrorism weapons. Russia has also been friendlier, canceling Uzbek debt and beginning to view Uzbekistan as a buffer state against Islamic extremism from both the Islamic State and Afghanistan. Russia has intensified cooperation with the Collective Security Treaty Organization and in the first months of 2015 the Russian Duma accepted a decree that permits foreign citizens to serve in the Russian army. Some experts argue that this decree gives Russia a legal tool to employ Central Asian nationals in Russian bases located in Tajikistan, Kyrgyzstan and Kazakhstan. It is also seen as a counter to the negative effects of the economic slowdown in Russia, a cause of anxiety for Central Asian states. Thousands of labor migrants in fact are returning to Tajikistan and Kyrgyzstan, after losing their jobs in Russia. As for Kazakhstan, the Western economic sanctions against Russia and low oil prices are among the crucial factors that prompted Astana to hold presidential elections in 2015. There is certainly a calculation by the leadership that the economic slowdown could worsen. By reaffirming Nazarbayev’s rule, Kazakhstani citizens were putting economic stability first. Nazarbayev’s re-election was a move to confirm Kazakhstan’s stability, putting foreign investors at ease. The current elite remains in power. In Uzbekistan, Karimov shares a similar logic. After his re-election he will keep his focus on maintaining stability, before finally deciding who will succeed him. In fact, experts argue that both leaders decided to postpone the issue of transferring power because of economic factors. Nazarbayev and Karimov could also coordinate their actions, as they know the risks they run, calling early elections in the same period. The differences, however, remain and it is hard to forecast a unique voice on thorny issues, such as Karakalpakstan or Southern Kazakhstan. Both leaders will try to take cautious steps in foreign policy. Their main worry is to balance China, Russia, and the West. Nazarbayev and Karimov will try to be as predictable as possible, a strategy renewed with these elections. However, in light of Karimov’s foreign policy style, some important foreign policy decisions could be made after the elections. In particular, experts expect an evolution in the relationship with the U.S. military and steps towards a free trade agreement with the Eurasian Union. As for Kazakhstan, Nazarbayev will continue to follow his traditional multi-vector foreign policy and will try to maintain balance between world powers, as Kazakhstan enjoys a significant degree of support from the U.S., China, EU, and Russia. Both elections can be seen as political testaments. Nazarbayev and Karimov have not yet publicly announced plans to step down, but some of their more recent statements can be read as a willingness to transfer power in the near future. That reading must be set against the traditional reluctance of autocrats to give up power voluntarily. So whether or not the next few years brings a drive towards constitutional reforms that transfer power from the presidents to the parliaments remains to be seen. In the meantime though, in the wake of two landslide victories, regional stability will be assured by the tenacious rule of Central Asia’s strongmen. Paolo Sorbello is the Deputy Editor of The Conway Bulletin and an independent researcher focusing on Kazakhstan. Daniyar Kosnazarov is Head of Central Asia and Caspian Studies Department, Geopolitics and Regional Studies Division, at the Library of the First President of Kazakhstan. The center of Central Asia has turned its focus to multilateral regional cooperation. The PLAN’s 70th anniversary celebration raises important questions about China’s increasingly capable military.